Although Latin displays many characteristics of nominative/accusative alignment, it also exhibits a number of properties that are typical of active/inactive linguistic systems. More specifically, the Latin verbal clause displays an active/inactive distinction, as it regularly marks, through the occurrence of dedicated morphological strategies, the presence of non-agentive as opposed to agentive contexts. This dissertation explores the syntactic motivations behind this opposition, addressing the crucial question about the relationship between syntax and morphology. The claim is made that verbal morphology in Latin is always syntactically motivated, since it directly reflects the difference between active and inactive structures. In particular, deponent verbs are shown not to be a case of syntax-morphology mismatch: these verbs exhibit inactive morphology because of their non-agentive properties. Moreover, it will be argued that syntax and semantics are closely related to each other within the syntactic computation. 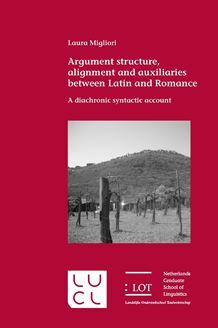 From this perspective, this thesis also provides an account of the development of a number of analytic constructions in Romance: perfective, possessive and deontic periphrases. Substantial attention is devoted to the diachronic study of the Romance auxiliation patterns occurring in these constructions and to their relationship with alignment and argument structure. The main claim is that the Romance outcomes of these periphrases are closely related to the active/inactive opposition characterizing the Latin system and to the alignment changes that characterized the passage from Latin to Romance. Therefore, these developments cannot be seen as isolated phenomena, but must be understood as the various manifestations of a systematic change affecting the whole linguistic system. Finally, the analysis and investigation of these diachronic facts confirms that syntactic reanalysis is one of the major forces at the basis of language change. This study will be of relevance to anyone interested in diachronic syntax, historical linguistics, classical philology and Italian dialectology.